It’s winter and what Candy Addict doesn’t love some liquid chocolate? I am a hot cocoa fanatic. I hate the cold, but the only ray of sunshine in an otherwise dismal winter is the prospect of hot cocoa. It must be served in the winter. 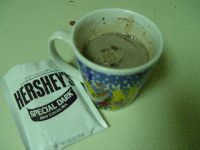 Thereâ€™s something so soothing about drinking warm chocolate when youâ€™re wrapped up in a blanket on a cold night. I chose seven types of hot chocolate for this tasting. They are, in the order I tasted them, Hersheyâ€™s Special Dark Hot Cocoa, Cacao Reserve by Hersheyâ€™s Mayan Blend Drinking Cocoa Premium Mix, Land O’Lakes Butterscotch Hot Cocoa, Land of Lakes Mint Hot Cocoa, Swiss Miss French Vanilla Hot Cocoa, Swiss Miss Dark Chocolate Sensation Hot Cocoa, and Godiva Hot Cocoa. The first obstacle in tasting all these cocoas was the water vs. milk debate. Some of the hot cocoas direct you to use water specifically, others say to use milk instead, and still others have water in the directions but say, â€œfor a richer creamier treat, replace water with heated milk.â€ At first, I decided to follow their strict instructions, but ended up winging it a little. I always choose milk over water, but for the purposes of the review, I used water when it was called for, in most instances. On to the reviews. . . They suggested water in their directions but optionally suggested milk for a richer, creamier treat. Iâ€™m all for richer and creamier so I used 6 ounces of 2% milk. I heated it in the microwave in a measuring cup and poured it over the cocoa in a mug. I had trouble getting all the cocoa to dissolve. I wish I had a small whisk for such a time. It was a bitter cup of hot cocoa with a sweet aftertaste that lingered. Personally, I love dark chocolate, but this was too bitter, even for me. I guess I like my hot chocolate sweeter than I like my candy bar chocolate. It did have a nice creamy foam that enhanced the experience. Afterwards, I felt like I needed to brush my teeth. They suggested 6 ounces of hot water to make this hot cocoa and didnâ€™t mention milk anywhere. In fact, there was some comment about the original cocoa drinkers mixing it with water, so I think they wanted you to use water, so I did. It was a very dark cocoa, maybe even darker than the â€œSpecial Darkâ€ I had just tried. It had a weird flavor that I couldnâ€™t really place. At first I thought it was a little nutty, although the ingredients do not mention any nuts. Then I thought it tasted kind of burnt. I did notice that tiny granules of the cocoa were visible when splashed against the side of the cup, like it didnâ€™t dissolve or something. It really wasnâ€™t chocolatey; that, or it just didnâ€™t taste like any chocolate I was used to. It was smooth though, and I think it was better than the Special Dark. As soon as I opened the package, this wonderful Butterscotch aroma came wafting towards me. It really made me eager to try it. It called for 6 ounces of water and, again, no mention of milk as an option, so I used water (against my better judgment). The powder was a pretty caramel color. When I mixed in the hot water, it was a pretty light chocolate color and had a good froth to it. It definitely had a buttery flavor. I wish I had bought two so that I could try one with milk. I think it would have been much better with milk. The froth was very tasty; it reminds me of a specialty coffee for some reason. Itâ€™s got a lingering sweetness about it. I liked it more than the others so far. At this point in the tasting process, I was starting to feel a little sick. Granted, I wasnâ€™t drinking the full cup of each type of cocoa, but still, all the sweetness was getting to me. I decided to eat a few grapes (Iâ€™ve heard they cleanse the palette), drink some water, and push on. Oh, the sacrifices we make as Candy Addicts. This cocoa suggested water as well, but since I regretted not using milk with the Butterscotch Land O’Lakes, I went ahead and used 6 ounces of milk with the mint flavor. When I opened the package, there wasnâ€™t a very strong mint smell to it. I had to stick my nose right up to the cup to smell any mint at all. As the milk heated in the microwave, I kept sniffing it to place the kind of mint that I smelled. In the end, I decided it smelled kind of medicinal, maybe even like that stuff you rub on your chest when youâ€™re sick (Vap-O-Rub? ), but much less strong. I poured it in the cup and poured the hot water over it and stirred well. It wasnâ€™t very dark and the cocoa dissolved quickly and fully, no globs of cocoa. The mint flavor was very light, just kind of a light aftertaste. It was sweet though. It was rich and creamy, probably due mostly to the milk I used. It wasnâ€™t as good as the butterscotch, thatâ€™s for sure, and I sure couldnâ€™t drink a whole cup of it because it was so sweet. It was too sweet and not nearly minty enough. 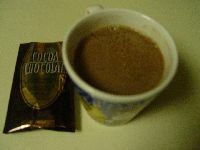 This cocoa called for hot water, not milk, so I used water as it suggested. 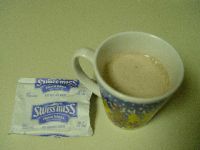 It created a very frothy hot cocoa and the cocoa mixed well with the hot water, no lumps. It smelled very vaguely of vanilla. When I tasted it, I was very pleased. It was delicious! It was sweet, but not too sweet. I imagine it would be very good with mini marshmallows. I didnâ€™t use any marshmallows in my reviews, thinking that it would cover up the true cocoa flavor I was reviewing. I do love mini marshmallows though. I used to drink French Vanilla Cappuccino in college to stay awake late at night, but I never really liked coffee. This is exactly like those French Vanilla Cappuccino drinks but without the coffee. Itâ€™s perfect! This was so good that I didnâ€™t want to pour out the rest of the mug to go on to my next cocoa tasting. The only consolation I had was that there were seven more packets in the Swiss Miss box to look forward to drinking another evening. 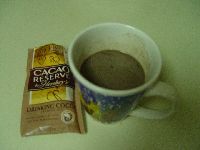 This cocoa was cheap, lower in calories and delicious! 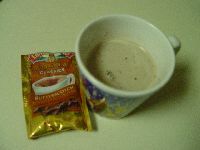 This cocoa called for hot water as well, so I went ahead and used it. The Swiss Miss packages say that the cocoa mix contains milk; perhaps thatâ€™s why they still taste good when you use water instead of milk. The powder was very dark. It didnâ€™t have a very good smell to it but you could see the sugar crystals mixed in with the cocoa. It looked like it would make a very dark cocoa. When I mixed the water and cocoa, there wasnâ€™t any froth at all. It had a rich, chocolatey taste, but not too bitter like the Hersheyâ€™s Dark I had tried earlier. It wasn’t too sweet so I could definitely drink the whole cup. It is a very indulgent cocoa, but also very good. It was like eating a candy bar. I would definitely recommend the Swiss Miss Dark. 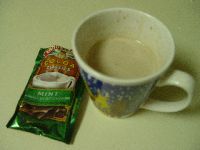 I initially rated this a 5 star hot cocoa, but after tasting the next and last cocoa, I bumped it down to 4 stars. These directions called for 8 ounces of milk. I used 2% milk and was happy to see a hot cocoa made for milk. I love creamy hot chocolate. The cocoa melted quickly in the hot milk and smelled delicious, and oh so chocolatey. There was no white froth, just some bubbles. It was rich and creamy, like youâ€™re drinking melted chocolate. It was the best, by far. I was glad I tasted this one last, so that I could drink the entire cup. If you can get some Godiva Hot Cocoa, please do. I found it on sale for $3.00 but it’s normally $5.00. I should have stocked up! The Godiva is definitely better than the Swiss Miss Chocolate Sensation (even though the Swiss Miss is very good) and the Godiva has fewer calories too! If you canâ€™t afford the $1.25 for a cup of Godiva hot cocoa, Swiss Miss Dark Chocolate Sensation is a great choice. 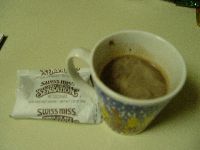 Swiss Miss really makes some good, inexpensive cocoas – both of the Swiss Miss flavors I tried were really great. Swiss Miss makes lots of flavors and I look forward to trying them all. I think Iâ€™ll save the Godiva Hot Chocolate for special occasions. thank you so much for sharing your review! you don’t know how long i’ve been on a quest for the best hot chocolate mix (for hot water). i currently drink the swiss miss dark chocolate sensation and have been for a long while now. didn’t hear about the swiss miss french vanilla, so will be on the lookout for that on my next grocery trip. will also look for the godiva’s for those special nights when i curl up with a good book or dvd – believe me, we do get some chilly nights in hawaii this time of the year…. If you’re in the market for a thicker more substantial sort of hot chocolate, the new Starbucks branded drinking chocolate is really good. It’s actual chocolate chunks, not a powdered mix! There is a peppermint variety, that’s the kind I got. Too delicious! Thanks for the thorough review (yeah, somebody’s gotta drink all that hot chocolate for us), and as I sit here at 1:15 in the morning, all chilly in my little Tucson home, I’d LOVE some Godiva. I swear I could almost smell it as I was reading and looking at the photo (which looked the richest of all, like chocolate pudding)! I had no idea there was butterscotch hot chocolate and that sounds really good to me (I love butterscotch), so I’ll go buy some tomorrow. If not for this review, I’d never have known…thank you! I’m always on the hunt for the “ultimate” hot chocolate…thanks for your sacrifices (reviews)..
I’m glad Swiss Miss and Godiva won! I’ve never had the Godiva hot chocolate but SW was always my favorite. I’ll be sure to try it sometime! Pssst…by the way, I tried Pep Chews after your rave review on them, and I must say, they are THE BEST! I will have to look for the Godiva next time I’m out. Ghiradelli is what I’ve been onto lately. It calls for milk which I didn’t know until I had already bought it and since I almost never have dairy milk in the house, I had to mix it with soymilk. I was expecting it to be yucky, but turns out it’s even better with soy and now I make it that way every time. If you want it lump free use a mixer for powdered baby formula. Just pulse it or you’ll have a mess. I love hot chocolate but I don’t like using water for it because I just don’t think it tastes very good at all. It just tastes like bitter water if anything half the time. I can’t stand Starbucks hot chocolate. However, I have found that just mixing something as simple as swiss miss into water and then adding hazelnut cream makes it taste wonderful and creamy. If you haven’t tried it, you definitely should. It works with all kinds of cream, probably, but hazelnut is my favorite. I use Coffee-Mate, by the way. I enjoyed reading your reviews being an avid cocoa drinker myself, and I agreed with most of what you said regarding each brand. However, I wish you had picked basic flavors to allow for a better review of each brand. I don’t think I could ever compare butterscotch and mint. I would like to mention that the Madagascar vanilla Land O’ Lakes cocoa is absolutely divine and it does have flakes of chocolate that melt as you drink. I used milk and I always use milk even if the directions tell me something else. I am a true chocoholic. The absolute best hot cocoa is HERSHEY’S COCOA. It’s the unsweetend powder in the dark brown tin used for baking. The recipe is on it. I’ve loved it for years. Also i just tried Starbuck’s signature salted caramel hot cocoa and I love it so much I’ve been getting 2 cups almost daily but it is quite expensive. Try it once. Wow–I’ve tried almost all of these, but I found that the Land O’ Lakes cocoas were the best. (I don’t like mint or raspberry, so I left those on the shelf.) Hazelnut was my favorite, but now I see they have tiramisu, creme brulee and noir flavors to try, but I’ve moved to Canada and have yet to locate a store that sells any Land O’ Lakes cocoas. I realize this is more underground but I tried The – Caffeinated Hot Cocoa mix sold on ThinkGeek – and it is the BEST I have ever had it was literally like a chocolate Beatch Slap , but the French Vanilla Superstar was so creamy its was a close second. I think the caffeine amount was perfect. WOW best thing to happen to hot chocolate in a 100 Years – good job thinkgeek.